Updated 8/26/10: We visited Siam Delight last week and had a very different experience. Gummy pad thai and a much smaller portion for the same price. A friend of ours had a similar experience, so we’re guessing the restaurant has changed hands. We recommend you try Sawasdee in Danvers instead. With signs of spring still few and far between, we decided to perk ourselves up with an indulgent lunch at our favorite Thai restaurant, Beverly’s Siam Delight. It did not disappoint, and we left with pleasantly full bellies and a lighter step. The pretty green walls, warm wood, and whimsical lighting in this restaurant are somewhat unexpected given its location next to a dry cleaner on Cabot Street. Locals are certainly not fooled, as evidenced by the full dining room and long take-out line at lunch. 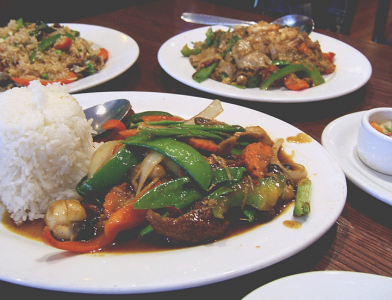 The food at Siam is consistently terrific—fresh and flavorful, and they never use MSG. We tried several new dishes on this visit and enjoyed all but one. First though, from previous meals we highly recommend the pad thai (well balanced sauce, good noodle texture, plentiful chicken and shrimp), and the duck green curry (just the right amount of heat and lots of sauce to coat the rice). We started our lunch with shrimp in a blanket ($6) but weren’t crazy about the texture of the minced shrimp and fish inside the crispy shell. We had no complaints about our entrees, starting with the homestyle duck ($8) featuring boneless slices of tender meat, crisp-cooked vegetables, and a tasty sauce. The large plate of food came with a good-sized mound of white rice—an excellent value. Longing for summer, we couldn’t resist ordering a dish named noodles on the beach and were glad we did. The wide noodles were succulent, and the sauce clinging to them and the vegetables featured a wonderful spicy basil flavor ($7.50). Our third dish was also a hit: beef magic fried rice. We don’t know about the magic, but the marinated beef, green peppers, basil, and plump rice grains made an addictive combination. Siam Delight just celebrated its tenth year in business, and it’s easy to understand their staying power. With great food at reasonable prices, it’s our bet they’ll be delighting diners for many years to come.